It is recommended that every driver equip their vehicle with a comprehensive roadside emergency kit. While there are kits available for purchase a major retailers, it’s really easy to make your own and tailor it to your specific needs. If you plan on making your own roadside emergency kit, here are a few things that definitely need to be included to ensure you are fully prepared all year round. First-Aid Kit – It’s important to have a first-aid kit handy in order to treat any minor injuries. Portable Fire Extinguisher – Include a small portable fire extinguisher so you can put out small fires if need be. Warning Triangles – These are used to notify other drivers that your vehicle is parked in the shoulder in order to avoid accidents. Tire Gauge – Keep a tire gauge on hand so you can ensure your tires are properly inflated in order to prevent accidents. Flashlight – Don’t forget to include a few extra batteries for your flashlight as well. 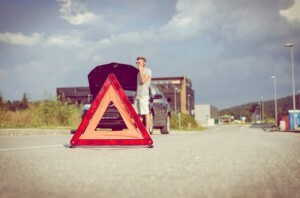 Jumper Cables – A dead battery can happen anywhere. Get yourself some jumper cables so you can jump start your car if the need ever arises. Cellphone Charger – A dead cellphone will be no use in an emergency, so make sure you have a back-up charger stowed away somewhere in your vehicle. Spare Gloves – Toss a few spare gloves in your emergency kit to keep your hands warm and clean while fixing a flat or working under the hood of your car. Tow Strap – You will also want to include a heavy duty tow strap in case you have to be towed out of a sticky situation. Potable Water – Just in case you are stranded for longer than expected, you need to keep some drinking water and non-perishable snacks in your car. Tire Chains – We all know that the weather can be unpredictable especially in certain areas of California, so you want to make sure you a prepared for snowy weather with a few tire chains. A Jack – If you ever need to change a flat tire, you will of course need a jack. Windshield Scraper – A windshield that is packed with ice or snow can be a hazard, so you definitely want to have a windshield scraper on hand. So, what are you waiting for? It’s time to begin creating your own roadside emergency kit. Include all of the items on our checklist to make sure you are prepared for anything and everything while on the road. I have been a customer of Tony Moreno Insurance for the last 8 years and they have always been there for me when I need them. They are professional and they give me the lowes prices around. I can't recommend them enough. All of my families cars are insured through Tony Moreno Insurance and most recently I insured my small business with them too. Thank you Tony for the great rates and professionalism over the years. Copyright © 2019 TonyMorenoInsurance.com. All Rights Reserved.